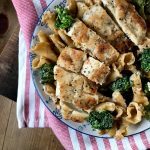 Garlic herb crusted chicken with a creamy garlic sauce over pasta and broccoli. In a small bowl stir together flour, spices, salt, and pepper. In a gallon size ziplock bag add chicken, kosher salt, olive oil. Shake bag to coat chicken with oil. Add flour mix and shake bag to coat the chicken with flour. In a large skillet over medium heat, add 2 tsp olive oil, add chicken and spray top side of chicken with olive oil cooking spray. Be sure not to over crowd skillet- you'll probably need to cook in two batches. Cook chicken for 4-5 minutes until crispy, flip, and continue to cook until cooked through. (I temp to 160, remove from pan, and let it rest) Repeat same steps for second batch of chicken. Please note: Let all of the cooked chicken rest on cutting board or plate and then continue to make creamy pasta and broccoli separately. When garlic is fragrant add dry pasta, 1 cup water, 2 cups chicken broth, and a pinch of salt & pepper. Bring to boil and the cover with a tight fitting lid, reduce heat to low, and continue to cook on low for about 12 minutes or until pasta is cooked through. When pasta is done cooking add half and half, parmesan cheese, and broccoli. Stir constantly for 2-3 minutes over medium high heat until sauce has thickened then reduce heat back to low. Put cover back on skillet to cook broccoli for another 1-2 minutes depending on how you like your broccoli cooked. Serve warm. Enjoy!